A new year brings new beginnings and as you may have read about in one of my post popular blog posts from last year, Frenzy to Fatigue to Focus, 2014 is a year for FOCUS. Part of that is streamlining the zestee services and rebranding. I thought this may be a good opportunity to share a little of the zestee branding story, which may be of help to other small businesses looking at initial branding or a refresh. When I started Zestee back in 2008, the first step was coming up with a name. That actually took months of deliberation as I needed something unique (both to catch attention and so that I wasn’t infringing trademarks) and something I personally felt a connection to. From early on, though the business has always been essentially just me, I didn’t want it too closely linked to my name (such as Renee’s Marketing Business!). I also saw the (now old fashioned?) trend of businesses going for names starting with an “A” to be first up in directories. The rebel in me wanted to go in the opposite direction! I’ve always had a zest for life and liked that word. The word “zest” was taken in Australia by Zest Health Clubs (which I’m not sure exist anymore actually) and “zesty” was also not available. It was a friend that smartly suggested….why not add the “ee” from your name and make it “Zestee” – still easily pronounced the same but unique. A google search turned up NOTHING with that name, and I instantly connected with it myself so felt I was onto a winner. Before deciding, I did a little market research, particularly checking that it had no negative connotations for people in Australia or The Netherlands (my two main markets). No! So that’s how the name came about. Next, I tried to find a logo that fit…and stepped right into an unfamiliar world of graphics and fonts! I had a few talented friends help mock up some logos and introduced me to sites such as dafont.com and istockphoto. WOW! The choices were endless. I also sketched a lot of ideas. Graphic design was on my wish list but I had no idea of the process and costs. I tried working with two lovely ladies but being as inexperienced as I was and with a very limited budget, I ended up with options that just weren’t quite right – and I didn’t have the budget to go further with them. So in the end, I just did it myself in Microsoft Publisher….and was actually really pleased with the outcome. I poured for hours over stock photos, mostly based around the word “zest” and with other images I loved such as colour wheels and pinwheels. In the end, the graphic you see now won me over as soon as I saw it. I bought it immediately and have used it since. Now, technically, it’s not a great logo….I’m still doing in in Publisher (which designers would completely cringe at!) but am hoping to learn to perfect it soon in Photoshop or Illustrator. But for now, I’ve had excellent consistent feedback from clients and have the flexibility to simply change whenever I like. It prints fine when I do have to print, and most of the time I operate online. There have been several changes over the years as I’ve played with different tag lines and have had the “social media. marketing. photography” one for over a year as I’ve dealt with relocating my business from Australia to The Netherlands. Now, in 2014, I am focussing on social media training. I’ve registered the trading name “zestee” in The Netherlands but also now “zestee social media school”. Big brands and marketing degrees will teach you that you MUST be consistent with your brand. In many aspects I agree. You don’t want to chop and change too much, and (potential) customers need to get to know and recognise your brand. However when you’re a small business and working almost entirely digitally, you need to be able to chop and change sometimes. Facebook, Twitter, Google+, Pinterest, blogs, website all have different size specifications. To optimise your branding, you need to be able to build it to fit. For me, that means that in some places, you will see my whole banner as above with “zestee social media school”. In other places you may see simply “zestee” or “zestee.com” or “zestee social media”. 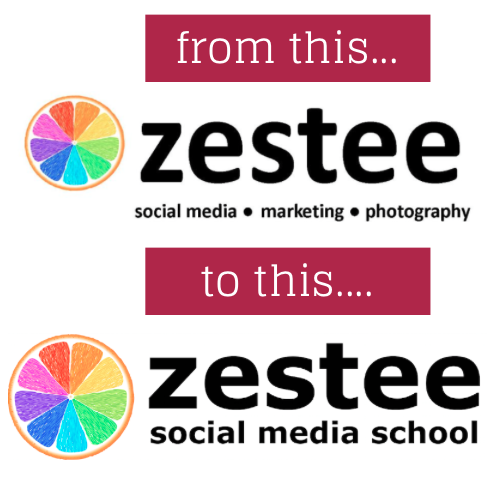 So that’s the story behind the brand for zestee/zestee social media/zestee social media school! I love hearing about how other brands are developed in small business, if you’d like to share your story, please contact me! I LOVE your logo. The pieces of the orange are just perfect – very zestee! I love the subtle changes to the brand too. 2014 is shaping up really well, I hope!